Another round with the MightyOhm! Welcome back Jeff! Jeff has a new job! He’ll be joining Valve as a hardware designer in June! There is a handbook for working at Valve that was previously released online. Additionally, another employee wrote about the culture of working at Valve. Jeff highlights the importance of networking. Chris has written about this before, specifically for engineers. In getting a new job, it’s becoming increasingly important to show a portfolio of sorts. Jeff does this by documenting his projects on his MightyOhm website. Jeff’s kit business will continue but may need to be outsourced to a third party. Kickstarter is getting bigger, as are the projects. The Pebble watch is now at $6 million dollars (and counting) and has 26 days left. Ian of Dangerous Prototypes visit the SEG market in Shenzhen and show off the true power of a large electronics ecosystem/supply chain. New type of patent agreement out of the engineering group at Twitter. States that patents will only be used defensively and continue to be used in the same manner wherever those patents go. Speaking of legal issues, a seemingly bogus lawsuit is being claimed against (many) companies that sell vacuum tubes with mercury in them…that they have mercury in them! Shocker! See more from this Hack-a-Day post and accompanying law filing. It was great having Jeff back on the show and we can’t wait to see what he develops while at Valve. We wish him the best of luck! 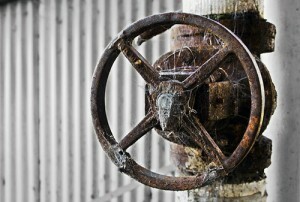 Thanks to sigma for the picture of the valve. I was reading http://www.logbook.freeserve.co.uk/seekrets/ and found something Jeff might have something to say about. On page 25 (PDF page number not the numbers printed in the text.) it refers to the plural of die as dice! There are rare times I’d wish to live at USA instead of Europe.. And listening this podcast was definitely one of the biggest reasons ever. Great show once again. Seems like a very interesting company, I’ve read their “HANDBOOK FOR NEW EMPLOYEES” just yesterday. While I think working at Valve headquarters sounds like an amazing life experience, I wouldn’t want to work for Steam Customer Support and a question if their values too. This is because last year I purchased ID Software’s Rage on the day it was released through steam and it was absolutely full of bugs. I attempted for several hours to get the game working but to no avail. Even John Carmack said the PC launch was a failure. So I asked for a refund and was denied simply because their T&C state no refunds. So they sold me a game and through no fault of their own it was not fit for purpose, then chose to keep my money and leave me with a game I cannot play. I would have really respected them if they had just admitted that the game was not fit for purpose and given me a refund rather than shafting me with their legal crap. I’m curious about how this worked out in the long run. One of the big advantages of Steam is that updates can be rolled out quickly and installed automatically. Were the problems you were having with the game resolved? Sorry. I think we have one more of your guest coming over to Valve. Where do I send the payment? Do you take cake? I just knew that was going to happen! Perhaps you could set us up as one of those pre-interview services? I don’t think he gets that joke yet Jeri. Valve! Let us drop the illusion. They may have created a couple of good games over the years, but they are hardly driving the game innovation forward. As far as I can see, their goal is to force the PC gamer into a pseudo console gamer with Steam, which is a world apart. It seems with most of the games you install these days, you are also forced to install the steam client. Obliged to have that “spyware” lurking in the background, keeping track of my gaming friends, what, when and how many hours we spend playing a game. This is obviously not for my eyes only, but utilized by the company too. I pay for the game, not for some third-party closed monitoring tool. This may not be entirely Valve/Steams fault, they probably offer a very good service to the game developers which gladly uses it, but for the gamer this locked-in solution is not desirable. Of course you need to be a gamer to create quality games. Probably by starting playing games from the mid 90s and up to now. You may get away with not having played too many games when creating the underlying software or hardware, but for the actual gameplay its needed. I would say with the current development of games, we reached a peak game quality back in 2005 or so. After that I presume the business folks took the lead. The most important part in this is “PC gamers are not console gamers”. @Johan P: On the flip-side, one could argue that digital distribution models, such as Steam, helped the game market survive on the PC. Game developers appear to be increasingly reluctant to make PC titles due to claims of piracy, thus they are opting to target consoles first. If it weren’t for Steam I think the situation would be worse. But then I could be wrong, I suppose there is always going to be cutting edge gaming enthusiasts out there, wanting to run pretty games on their monster hardware. This week was especially full of “lawyer bashing.” 🙂 I wonder how Dave really feels about the legal profession. We’re not *completely* evil; however, I’ll be the first to admit that the patent and tort systems are far from perfect. Can’t wait to see what comes out of Valve in the next few years!